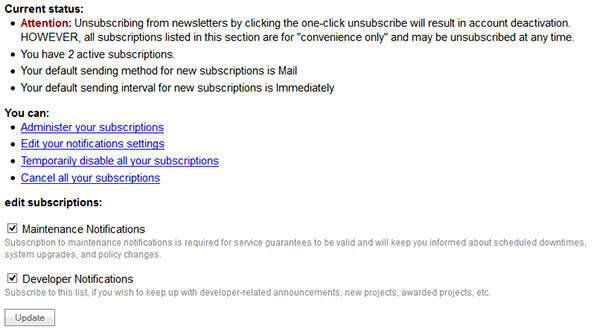 ShrinkTheWeb Manage Email Announcements and Subscriptions? Email Notification are our way of letting you know about changes to our system that may effect your site. These may include anything from scheduled downtime to necessary coding changes and more. Note: For PRO, Plus, and Basic Users, implicitly expressed guarantees of service may be rendered void if you are NOT subscribed to Maintenance Notifications. This would pertain to refund requests resulting from a service interruption previously announced as scheduled maintenance. Check the subscriptions you are interested in. Uncheck the subscriptions you are no longer interested in. Whenever you comment in a thread on our forum you are automatically subscribed to notifications from that thread. Select all notifications by checking the global select checkbox left of the "Node" label then use the global Send Interval option located at the bottom right of the node list and click Update. Select all notifications by checking the global select checkbox left of the "Node" label and click Delete.